Crude Life portable science museum visits the LSU Museum of Natural Science. Photo by Paige Jarreau. It's Science. It's Art. It's Crude Life. Crude Life is hard to define. It’s objects and artifacts, it’s scientific research, it’s a place, it’s science, it’s art, it’s climate change embodied. 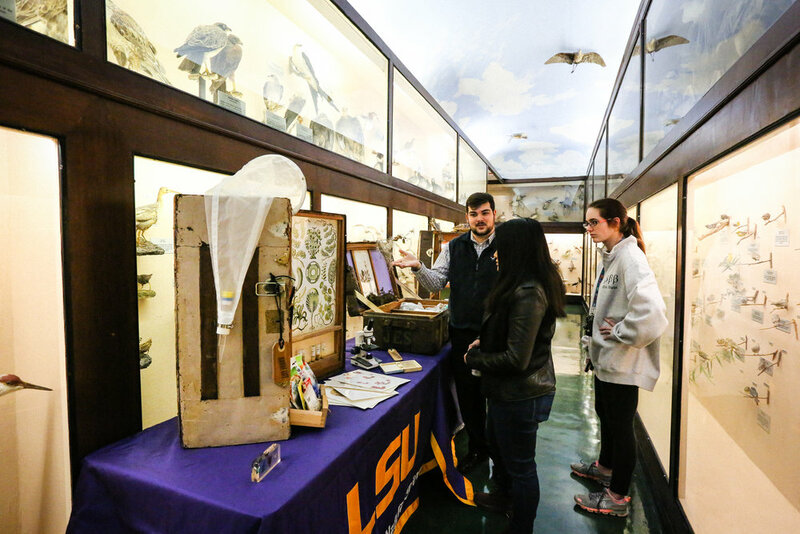 A view of a Crude Life trunk at the LSU Museum of Natural Science. Photo by Paige Jarreau. 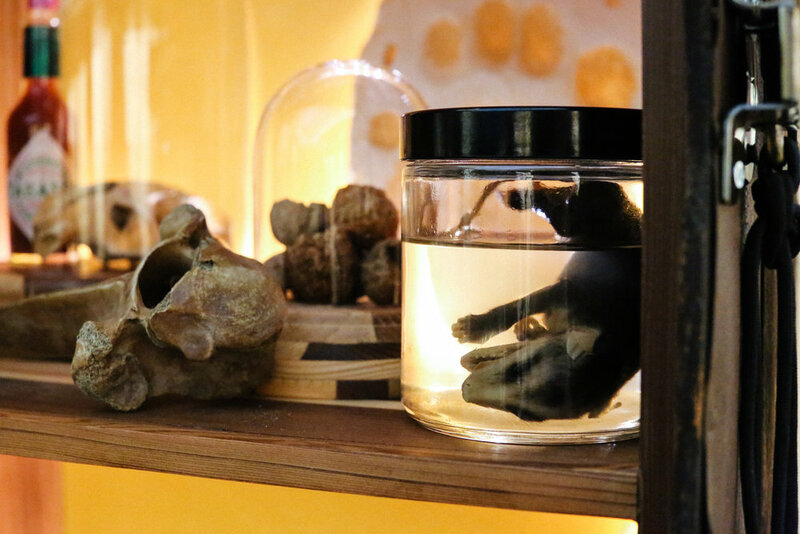 Crude Life is a mobile museum showcasing endemic species affected by climate change and the 2010 Gulf of Mexico oil spill, from tiny fishes, to insects, to aquatic mammals, in galleries that combine science and art. The project is a multi-institution collaboration between artists, scientists, musicians, and professionals who occupy the spaces between these disciplines. The museum, full of marine species preserved in glasses, jars and boxes, artistic scientific drawings, microscope slides full of tiny marine plants and animals, insects and minerals in pretty glass vials, and even odd-shaped nut shells representing the tiny sculptures squirrels create as they co-inhabit our environment, travels around the country, from California to the Gulf of Mexico region to Boston, packed in wooden “treasure chests.” The trunks are antique sea chests retrofitted with wood salvaged from buildings and trees damaged by hurricanes. Climate change has created this museum. Crude Life is the brainchild of LSU postdoctoral researcher Brandon Ballengée, a scientist and internationally renowned artist who teamed up with Prosanta Chakrabarty, Associate Professor and Curator of Fishes at the LSU Museum of Natural Science, to explore biodiversity changes in the Gulf of Mexico on the heels the 2010 oil spill and climate change. The project is both an artistic exploration as well as a science and citizen science investigation of Gulf of Mexico biodiversity over time, funded through the National Academies Keck Futures Initiative. 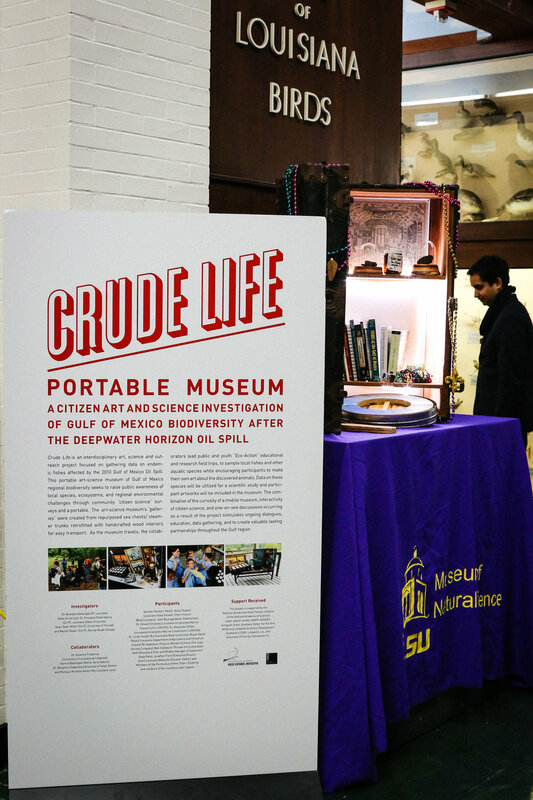 Prosanta Chakrabarty introduces Crude Life to visitors at the LSU Museum of Natural Science. 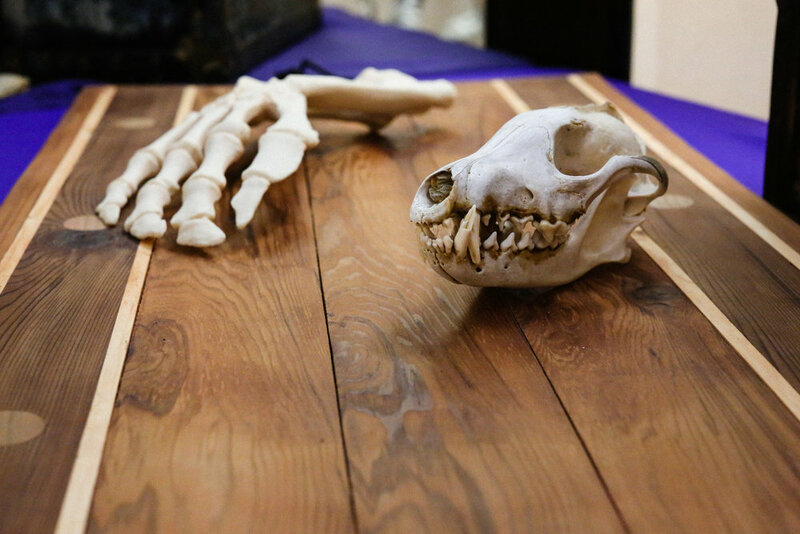 He holds a piece of wood fashioned from the wood of several prominent science and natural history museums around the country. Visitors can step on the piece to "step into" the halls of some of greatest museums in the country. Photo by Paige Jarreau. The 2010 Deepwater Horizon oil spill had far-reaching impacts that are still not fully understood. The spill affected marine life, Gulf Coast communities and even individuals internationally, including Brandon, who traveled to Louisiana from Quebec, Canada on several occasions in the aftermath of the spill to work with Gulf communities, volunteer and create art inspired by this crisis to promote awareness and engagement. “All the loss, the loss of life, really struck me, and I wanted to do something about it,” Brandon said. Brandon quickly got to work collecting Gulf of Mexico specimens as well as citizen stories of environmental changes with colleagues in the Chakrabarty lab. He also reached out to Sean Miller, an associate professor in University of Florida’s College of the Arts, with a revolutionary idea – create a portable Gulf of Mexico biodiversity museum that would travel to the people who stand to lose the most from the oil spill’s impacts, biodiversity loss and climate change. 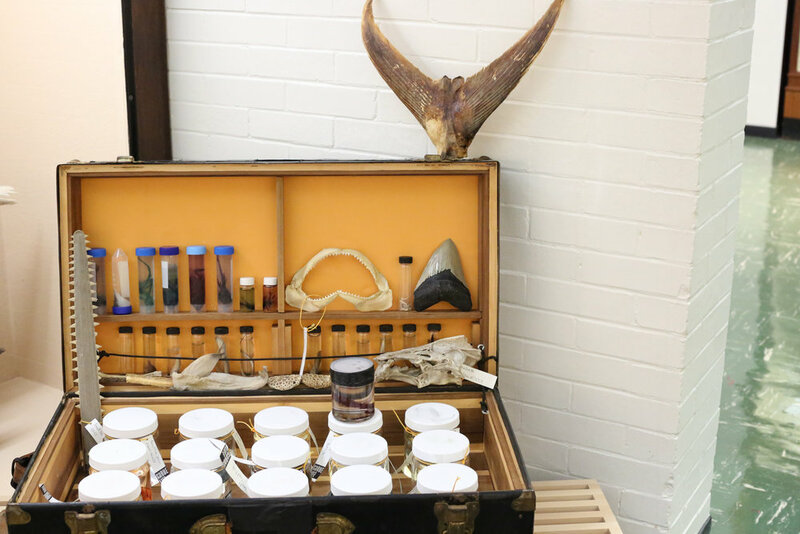 A Crude Life "treasure chest" filled with beautiful "cleared and stained" marine specimens and other marine objects, including a bluefin tuna tail, one of the most expensive fishes in the world. Photo by Paige Jarreau. Sean informed the overall design of the Crude Life exhibits, and also created many of the paintings viewers can see in the mobile museum. Sean was working on a John Erickson Museum of Art project, a location variable museum composed of aluminum carrying cases that can be transported via airplane or car as a “museum on the road,” when Brandon contacted him about Crude Life. Crude Life set up at the LSU Museum of Natural Science. Photo by Paige Jarreau. 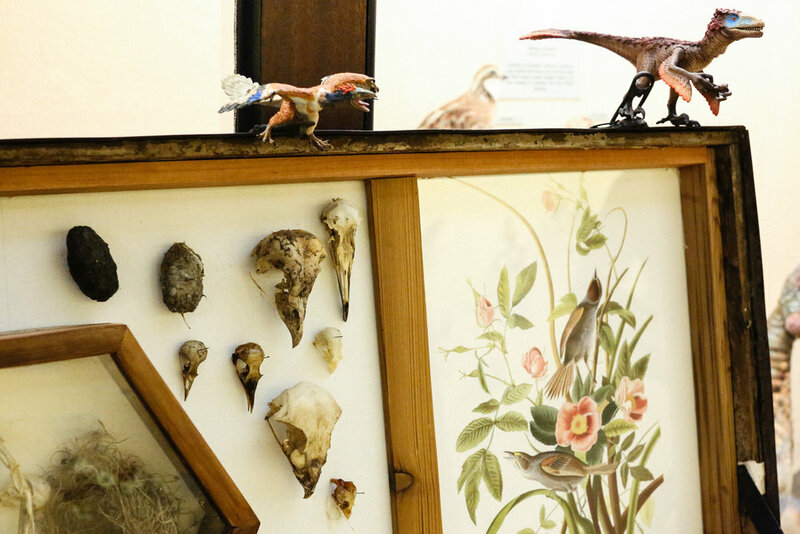 Anything and everything in the museum is meant to be explored, picked up and interacted with – not exactly like your typical science museum. The museum’s very presence is often a surprise for viewers. “It’s fun to show us somewhere with these trunks and open them up as people wonder, ‘What’s going on? 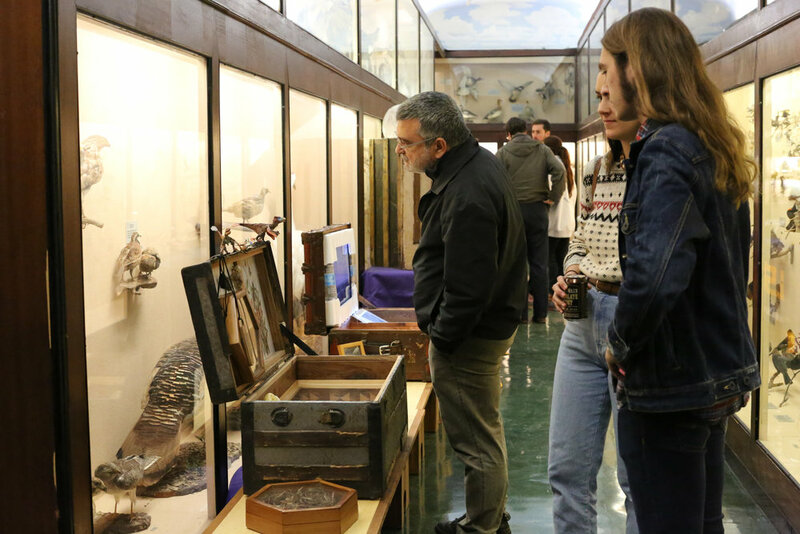 ?’ Every museum is trying to inspire curiosity it its viewers and get them engaged, and I think the element of surprise with the mobile museum helps make that happen,” Sean said. 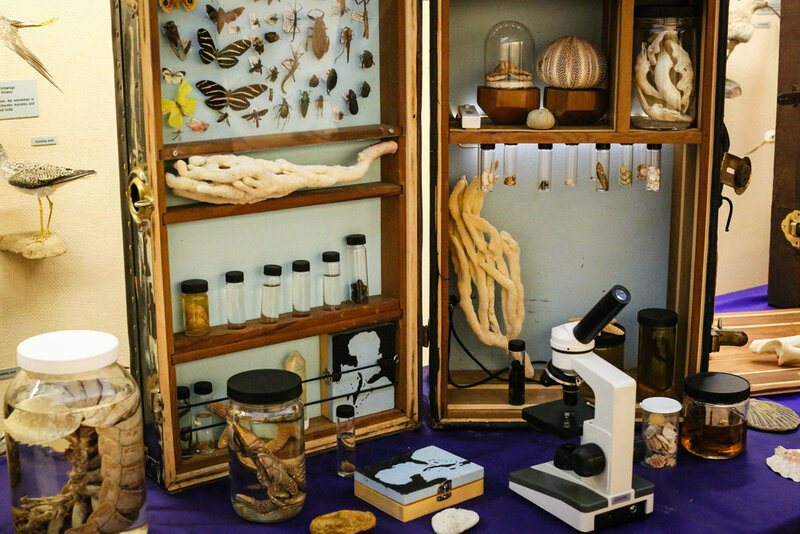 A microscope exhibit in Crude Life lets visitors explore microscopic Gulf of Mexico life. Photo by Paige Jarreau. Another mission of the Crude Life project is to empower citizens to take part in scientific research. For example, Brandon is collaborating with Louisiana fisherman and shrimpers to look for elusive marine species have haven’t been seen since the 2010 oil spill. Out of the original “Wanted” list of missing species, two have been found with the help of citizen efforts, but Brandon hopes that others will get involved to look for the rest. Brandon plans to take the Crude Life mobile museum chests to Gulf of Mexico fishing rodeos and fishing competitions in the near future, to get more folks involved in looking for the missing species. 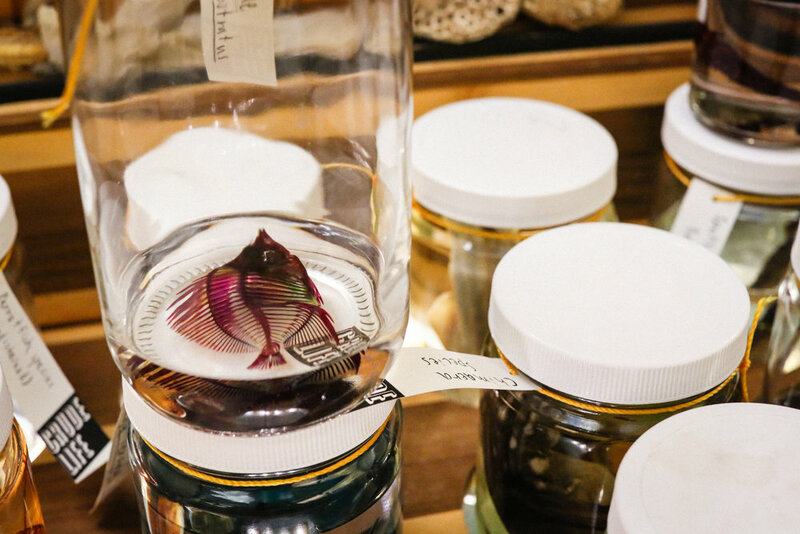 Cleared and stained specimens in the endemic marine species chest within Crude Life raise awareness of marine species that have been missing since the 2010 oil spill. 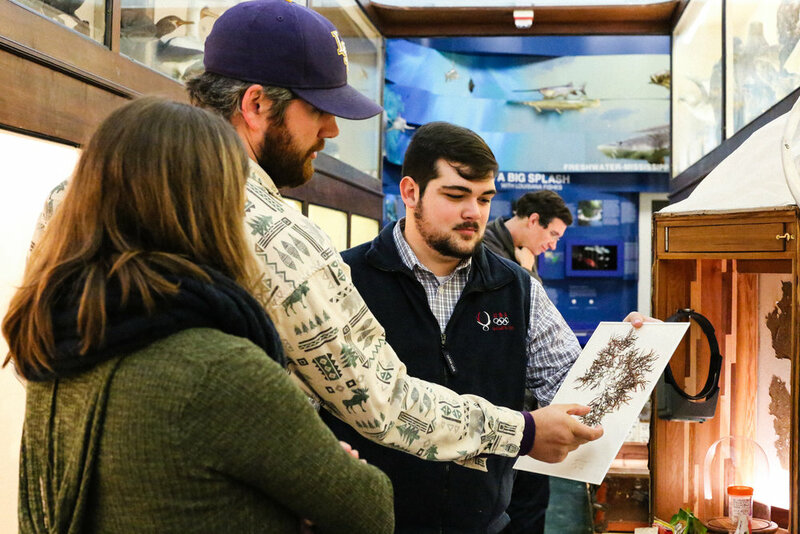 “People always respond strongly to the cleared and stained specimens in our Crude Life trunks, because they’ve never seen anything like them,” Brandon said. Photo by Paige Jarreau. Individuals and organizations who want to get involved with the Crude Life can contact Brandon through his website, brandonballengee.com or at bballengee@lsu.edu. Citizens and kids who attend Crude Life events along the Gulf can help Chakrabarty and Ballengée’s team collect specimens, learn about the process of clearing and staining specimens for morphological analysis, and create art surrounding their experiences. Shrimpers and other fishing organizations can also get involved by contacting Ballengée about saving bycatch for identification of endemic species. Ballengée has a handout of 15 marine species that haven’t been seen since the spill, that fisherman and citizens can be on the lookout for. Crude Life Investigators include Dr. Brandon Ballengée (PI, LSU), Dr. Prosanta Chakrabarty (Co-PI, LSU), Sean Owen Miller (Co-PI, University of Florida) and Rachel Mayeri (Co-PI, Harvey Mudd College). Featured in Crude Life, the late Robert Rashenburg was an artist and painter who created performance art pieces with turtles carrying flashlights. The performances, while artistic, may have had negative impacts on endangered Florida Gopher tortoises. Photo by Paige Jarreau. Crude Life Collaborators include Dr. Suzanne Fredericq (University of Louisiana at Lafayette), Aurore Ballengée (Atelier de la Nature), Monique Michelle Verdin (My Louisiana Love) and Dr. Benjamin Dubansky (University of Texas Denton). Other Crude Life participants include Senator Norbert ‘Norby’ Nolty Chabert (Louisiana State Senate), Cherri Foytlin (Bold Louisiana), Josh Baumgardener (Haliburton), Dr. Edward Chesney (LUMCON), Dr. Alexander Kolker (LUMCON), Dr. Linda Hooper Bui (LSU), Blaise Daniel Pezold (Louisiana Department of Agriculture and Forestry's Coastal Re-Vegetation Project), Randon Dufrene (Tee Jug’s Shrimp Company), Bob Chateaulin (Private horticulturalist), Keith Broussard (Fish and Wildlife Manager of Cypremort State Park), Jonathan Foret (Executive Director South Louisiana Wetlands Discover Center), Link Morgan (LSU), members of the Pointe-Aux-Chenes Tribe and students and residents of the Louisiana coast regions. Support for Crude Life comes from an NASEM National Academies Keck Futures Initiative (NAKFI) Interdisciplinary Projects Grant Award, and an Acadiana Center for the Arts (ACA) and Lafayette, LA Economic Development Authority (LEDA) Artspark Grant, and from the University of Florida, Gainesville, FL.